This was a lovely little commission from a customer who had collected a special handful of stones from the beaches of the Isle Of Arran in Scotland. He wasn't sure exactly what he wanted me to make with them., but over time I worked with him and suggested various ideas. This ended with me creating a selection of necklaces using the stones - both wire wrapped in silver wire, and also set in solid silver settings. 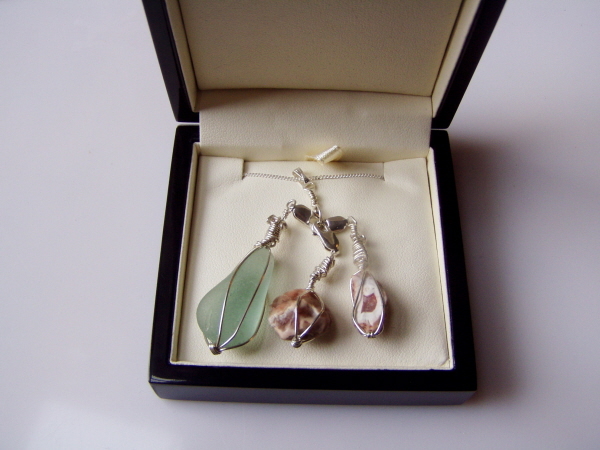 I attached the silver wrapped stones to lobster clasps which meant the owner could use them in different ways. They could be clipped and unclipped to and from necklaces, and also used as charms on a bracelet.